Lexus’ best-selling model after the RX, a luxurious SUV, is the ES, a luxurious saloon. The outgoing sixth-generation Lexus ES still looks fresh from the oven. It has been six years since its launch in 2012, but you will be excused to assume it was much later. The car has not aged a day with its sleek and chiselled silhouette. Even the facelift nip-and-tuck in 2015 was slight and relatively unnoticeable. Razor-sharp steering feedback targets the sporty towkay as the “ES-cellent” onboard equipment takes great care of him. The 2019 Lexus ES may look like the flagship LS at first glance, but it appears muscular and more athletic, as if it spent many hours in the Lexus gym. There is a pair of defined, ripped shoulders aft of the C-pillars. The saloon cuts a striking profile with a drag coefficient of only 0.27 for the Lexus ES250 and 0.26 for the ES300h (with a boot spoiler and if equipped with narrower 215/55 R17 tyres). The imposing corporate front-grille design takes after the two-door Lexus LC coupe and the Lexus LS limousine, and will remain a conversation piece. 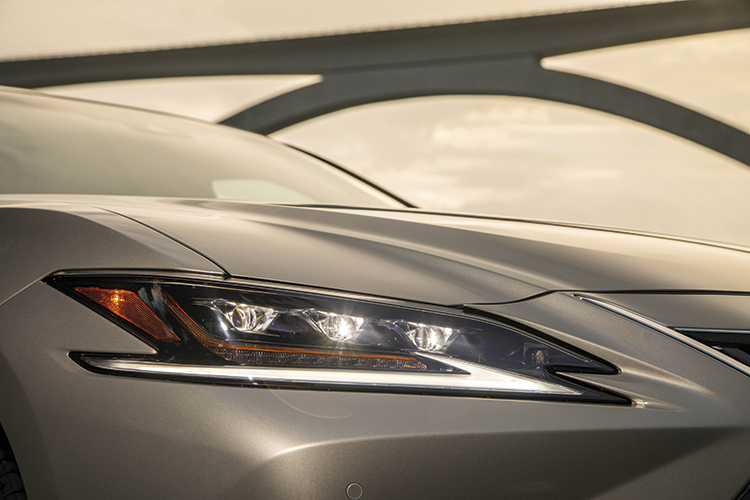 For the Lexus ES, the signature spindle grille is differentiated by vertical lines (the grilles on the Lexus LC and Lexus LS are more mesh-like) and is satin-plated. It’s “Japan Airlines” business class for coddled bosses in the front. 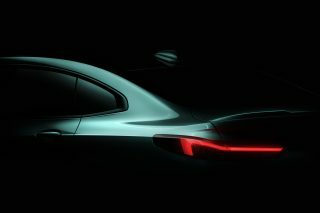 Yasuhiro Sakakibara, chief engineer of the newest Lexus ES and also deputy chief engineer of the latest Toyota Camry, told me that his favourite aspect of the car is the styling. He said if you are in your backyard, you just want a beer and to keep looking at the Lexus ES. This is the first model to roll off the assembly line on Lexus’ all-new Global Architecture-K (GA-K) platform, which is front-wheel-drive in the case of the ES. 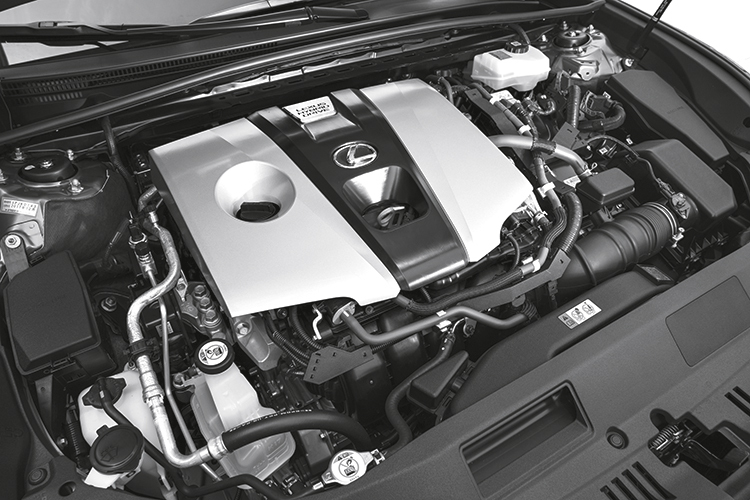 The LC and LS are on Lexus’ GA-L platform. The GA-K chassis uses more than twice the structural adhesives than the last ES. Laser screw-welding, as used in the LS, is also employed here. This is more precise than traditional spot-welding and prevents distortion of body panel, because laser generates less heat during the process. The new Japanese luxury saloon is 45mm wider, 65mm longer and sits 5mm lower than the previous Lexus ES. The wheelbase is also longer by 50mm. Each wheel is nearer to every corner of the new body, which results in tracks widening by 10mm at the front and 30mm at the rear. The squat and purposeful stance declares the saloon’s sporty intentions. 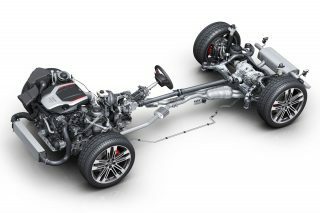 The MacPherson-strut front suspension has been tweaked to improve response and the rear suspension is all-new, with multi-link trailing arms in lieu of struts. 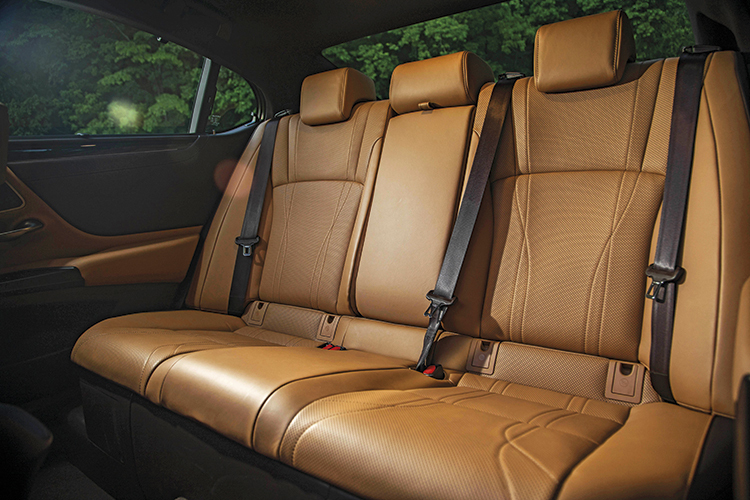 Lexus touts the new ES to be quieter and more cavernous. Rear legroom is LS-like. “Couple distance” for the front and directly rear occupants is a class-leading 1022mm – great if your driving spouse has bad breath and the air-con is not at full blast. On the move, the luxurious cabin is noticeably more refined through the extensive use of even more soundproofing materials. The stiffer body also contributes to the improvement. 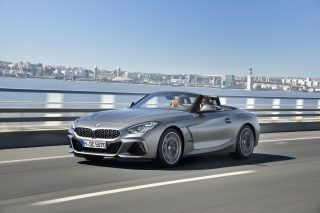 To me, the biggest difference between the old and new models is the steering feedback – it is night and day. 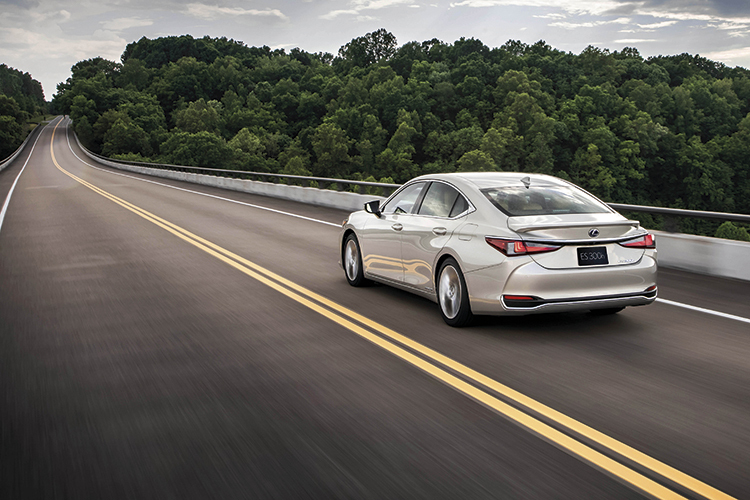 In the earlier Lexus ES, the steering is woolly and uncommunicative, but in the 2019 model, it’s razor-sharp, thanks to a new electric power-steering system mounted directly on the steering rack instead of the steering column. The offshoot is greater steering adjustability, with 30mm of additional tilt and 40mm longer telescopic range. Pampered passengers in the rear enjoy “Japan Airlines” first class. 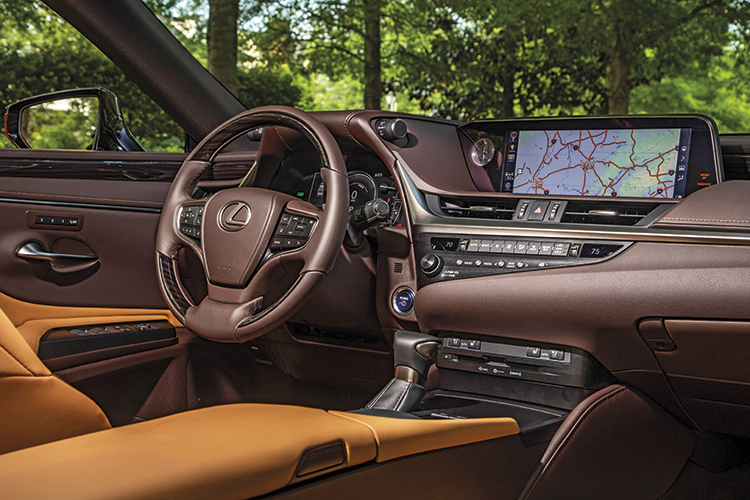 It was a delight to steer the new Lexus ES on the twisty back roads of suburban Nashville. I was in complete control as I flicked the steering wheel left and right, with no second-guessing whether I was in my lane on the tight and narrow roads. 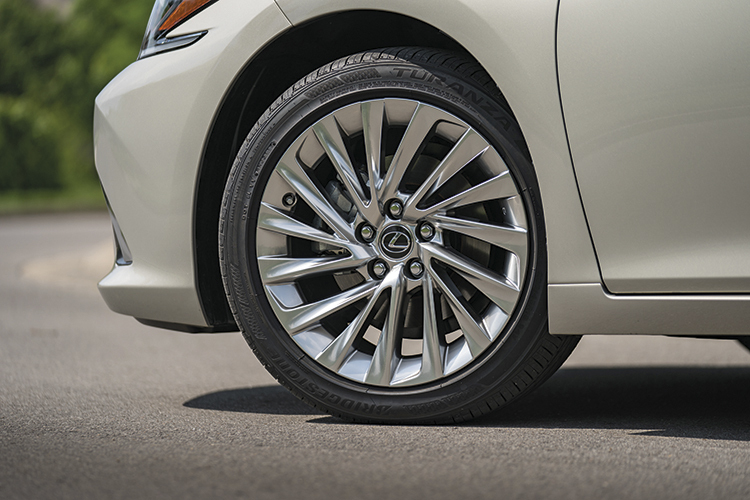 The Bridgestone Turanza T005A tyres, though being comfort-oriented, did not squeal like country pigs as I drove the Lexus ES like a sport sedan. The Lexus’ ride was composed, with little body roll, and it felt lithe and sporty. Yes, the new Lexus ES now handles like how I drove it – a sport sedan, whilst still gliding over small road bumps and crevices like how a Lexus should.Singapore will receive the ES250 and the petrol-electric hybrid ES300h. The non-hybrid model has a new 2487cc 4-cylinder engine – the same capacity as the replaced motor, but with a longer stroke and narrower bore to enhance fuel efficiency. Compared to the preceding engine, the new 4-pot motor delivers 26 horsepower more, or 207hp, and an extra 12Nm of torque, or 247Nm. The exterior colours include this one called Ice Ecru, and ES-specific beige that is said to “mimic golden light reflecting off fresh snow”. The front wheels are driven via a new 8-speed Direct Shift automatic transmission, which has two more gear ratios than the last autobox. It also runs between 250rpm and 300rpm lower at 100km/h than the old 6-speeder. The acceleration felt tardy though, as reflected by the 0-100km/h figure of 9.1 seconds, which is the same as the previous Lexus ES250 despite the improved power and torque. The culprit anchoring down the new car is its kerb weight of between 1600kg and 1660kg, compared with the old car’s 1585kg to 1615kg. I suspect the main guilty party is the additional sound insulation. 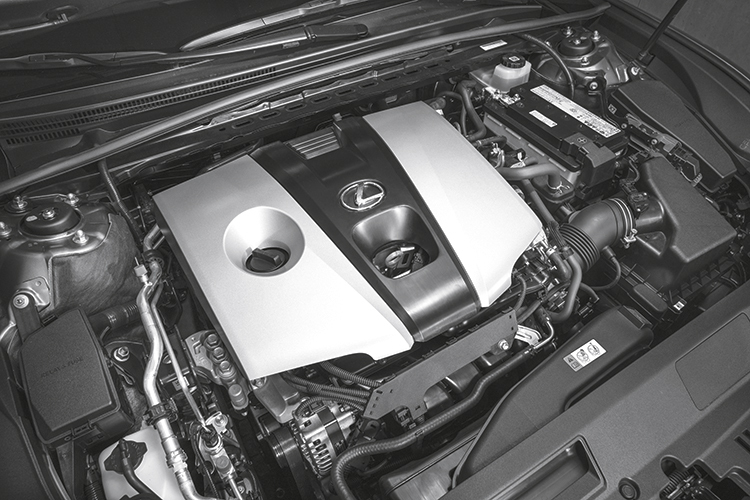 Alas, Lexus missed an opportunity to turbocharge the new engine for more power and torque to complement the sharp handling. It could have been a giant-killer against the competition. The new 4-pot engine also finds a role in the hybrid, mated with a lighter and smaller electric motor. Hand in hand, they produce 218hp of total power at 5700rpm and 221Nm of total torque from 3600 to 5200rpm. Like the previous ES, transmission of powertrain output is via CVT. The hybrid is the one to get if you want a more satisfying drive. The pick-up belies its 8.9-seconds century sprint, for it feels faster. The “rubber band” character of previous hybrids with CVTs has been reduced. In this fourth-generation Hybrid Drive System, the engine speed is aligned more closely with vehicular speed for a more linear acceleration. The nickel-metal hydride battery is now relocated under the rear seat instead of the trunk, thanks to a 12cm slimmer structure and a compact cooling system. This means that boot space in the hybrid version is no longer compromised and offers the same 473 litres of cargo capacity as in the Lexus ES250. In the previous Lexus ES hybrid, it was 425 litres. The interior is well-executed and classy. The steering wheel has been nicked from the Lexus LS and a massive 12.3-inch multi-information display takes centre stage. 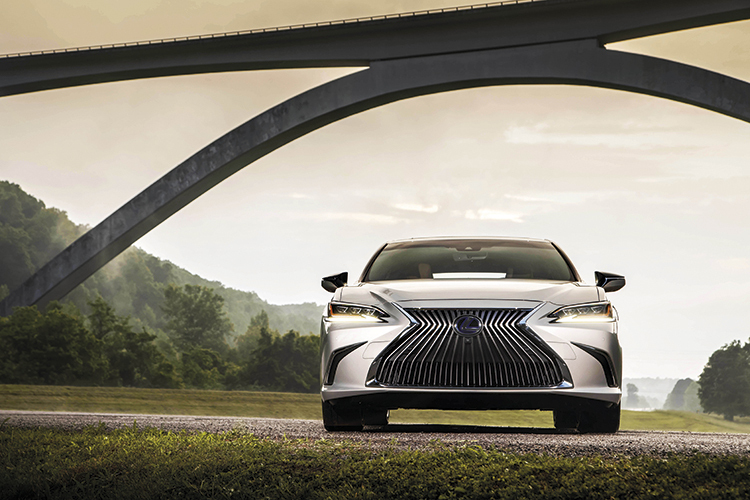 Imposing front grille of the new Lexus ES takes after the LC coupe and LS limousine. 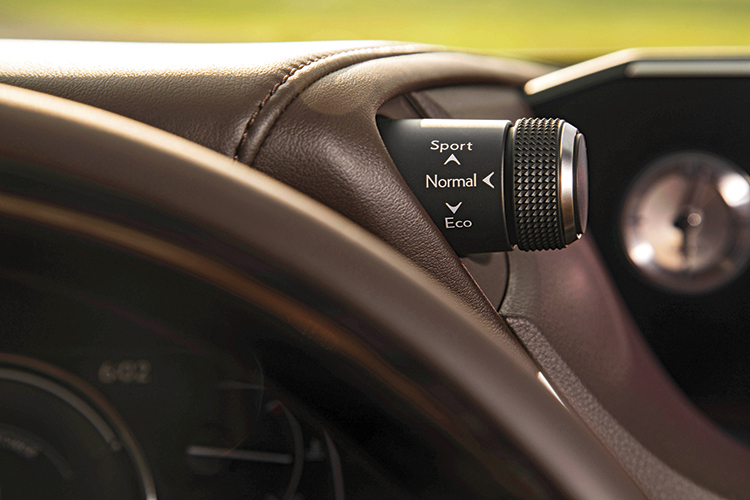 There is a pair of cheeky “Shrek ears” knobs on the driver instrumentation binnacle – the right for the Eco, Normal and Sport settings, and the left for traction control. 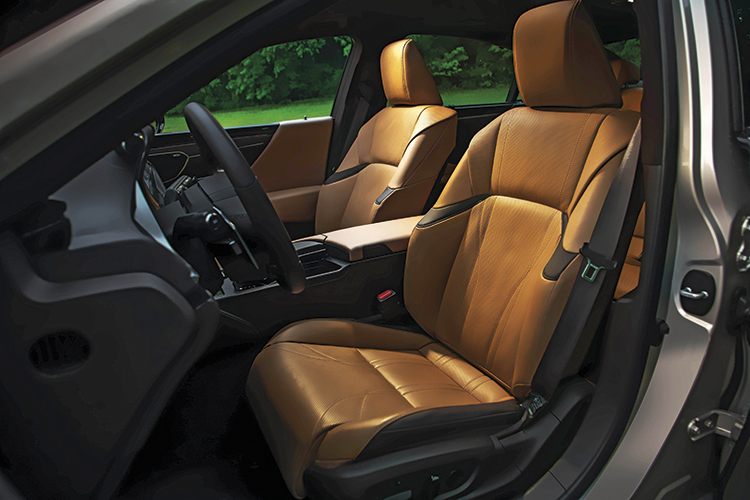 The cabin is bathed in exquisite leather with four colour options – Chateau (tan), Topaz Brown (orangey brown), Black and something called Rich Cream (beige). 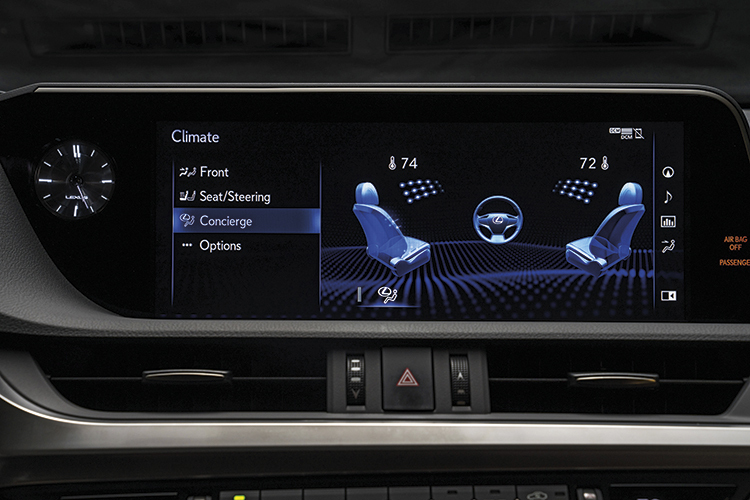 The Lexus Safety System has also been upgraded to include, inter alia, night-time pedestrian detection and daytime cyclist detection to reduce the risks of being charged in court for reckless driving. 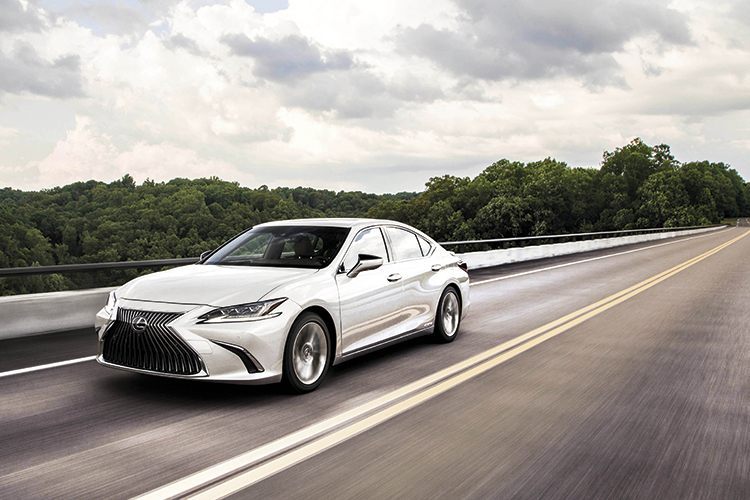 The new Lexus ES handles like a sport sedan, whilst still gliding over the road like how a Lexus should – quietly and comfortably. Borneo Motors will offer the latest Lexus ES in Executive and Luxury trims for both variants in the fourth quarter of this year. 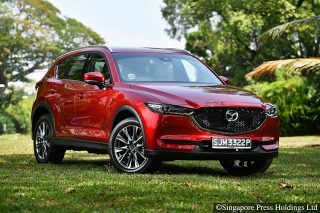 Notably, the Luxury version gets a head-up display projecting customisable information on the front windscreen and a 17-speaker Mark Levinson audio system (the Executive edition gets a 10-speaker Pioneer system). Towkays and tai tais may prefer the Luxury-spec ES, whose standard equipment includes electric rear seats that recline up to 8 degrees. Lexus intends to win over new customers with the new and exceptionally sporty ES. Don’t bet your money against it.